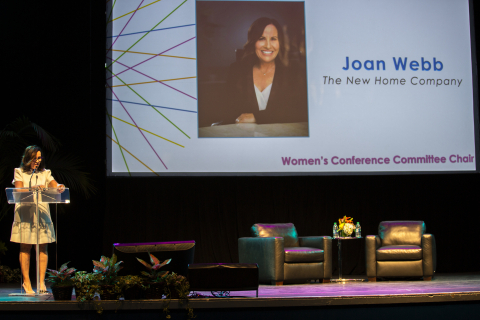 ALISO VIEJO, Calif. , April 12 /Businesswire/ - On Friday, April 12, 2019, the Building Industry Association/Orange County Chapter (BIAOC) and The New Home Company (NEW HOME, NYSE: NWHM) presented the 5th Annual Women’s Leadership Conference, a pioneering event dedicated to furthering opportunities for women and addressing the unique challenges they face in homebuilding. NEW HOME Chief Marketing Officer and the founder of the conference, Joan Marcus Webb, served as this year’s chairperson for the fifth and final time. The sold-out conference attracted over 700 attendees to The Grove of Anaheim. The event was launched in 2015 as a critical platform objective of Webb when she served as BIAOC President. It has grown every year since. Webb passed on the leadership of the conference to Ali Wolf, Director, Economic Research for Meyers Research who will serve as Chair for the 2020 conference. This year’s conference, which once again was open to men and women, was themed “Oh the Places You’ll Go” and was highlighted by an impressive roster of featured speakers, including Randi Zuckerberg, the founder and CEO of Zuckerberg Media. Zuckerberg is the former Head of Marketing at Facebook, an entrepreneur, investor, bestselling author and tech media personality. Also providing keynote addresses was Dianne McGrath, a successful researcher, consultant and Mars One Astronaut Candidate, and Megan Telles, a reporter with KTLA 5 News in Los Angeles. The Building Industry Association of Southern California – Orange County Chapter (BIA/OC) is a non-profit trade association focusing on education, networking, and advocacy for its more than 1,100-member companies within the home building industry. The Orange County Chapter is one of four chapters that make up BIA-SC and is also affiliated with the California Building Industry Association (CBIA) and the National Association of Home Builders (NAHB). Please visit www.BIAOC.com.